GRAND CANYON, AZ — Energy Fuels Inc. recently reported that it has completed drilling of it’s uranium mine shaft at Canyon Mine, which is located just miles from the Grand Canyon. The company is now creating a plan based upon results of the drilling before it can resume construction at the site. They have also temporarily fired most of their workers. 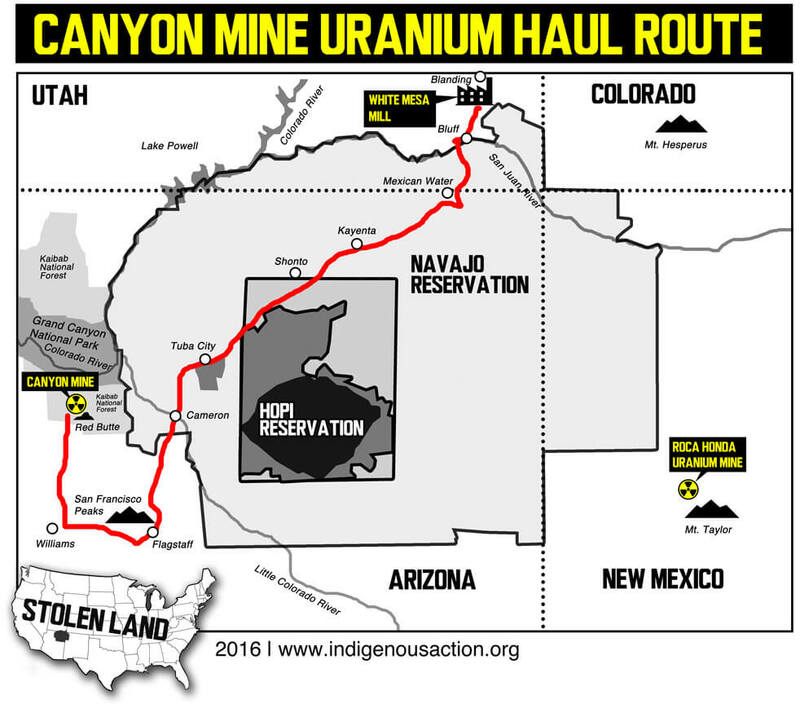 Energy Fuels threatens that uranium ore extraction could begin at Canyon Mine as early as June 2017. 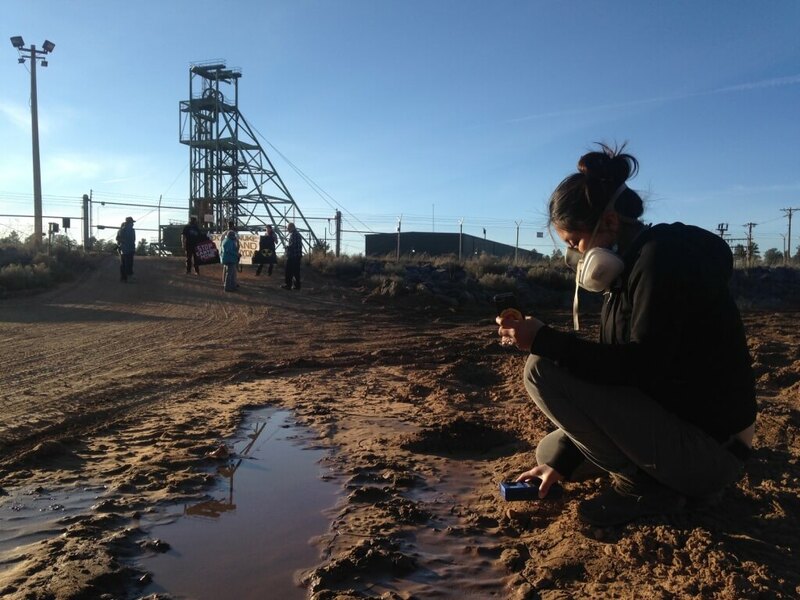 On Sunday, March 12, 2017, representatives from Haul No!, Diné No Nukes, Clean Up The Mines, The Golden Rule, Veterans for Peace, Sierra Club, & Center for Biological Diversity, conducted a site visit to monitor Canyon Mine operations. 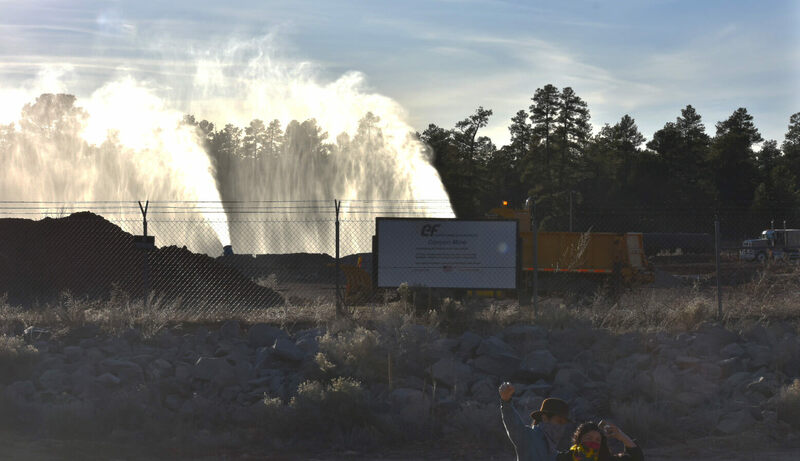 The groups witnessed Energy Fuels workers spraying water more than 40 feet into the air and multiple unmarked water trucks on driving into the site. They also witnessed the water being sprayed into surrounding forest and traditional cultural property. Several of those monitoring took a banner reading “Don’t Nuke Grand Canyon, Stop Canyon Mine” into the mining area and confronted the workers. Miners stated that “nothing toxic” was coming out of the mine. According to the Arizona Republic, samples taken at the mine’s holding pond tested at 130 parts of dissolved uranium per billion. Environmental Protection Agency regulations state that anything over 30 parts per billion is unsafe to drink. Although the groups have provided video and photo documentation, the Arizona Department of Environmental Quality and Kaibab National Forest Service have denied any violations have occurred. Communities on the Navajo Nation along the haul route from Canyon Mine to the White Mesa Mill were not formally notified of hazardous materials being transported. “This is another prime example of environmental racism, to allow unregulated transport of radioactive liquids in unmarked trucks through communities and without notifying the public or any of the surrounding Indigenous Nations. We have a right to know, at the very least, so proper preparations and emergency response are in place in case of a spill or accident,” said Leona Morgan, who works with Diné No Nukes and is a Haul No! Volunteer. 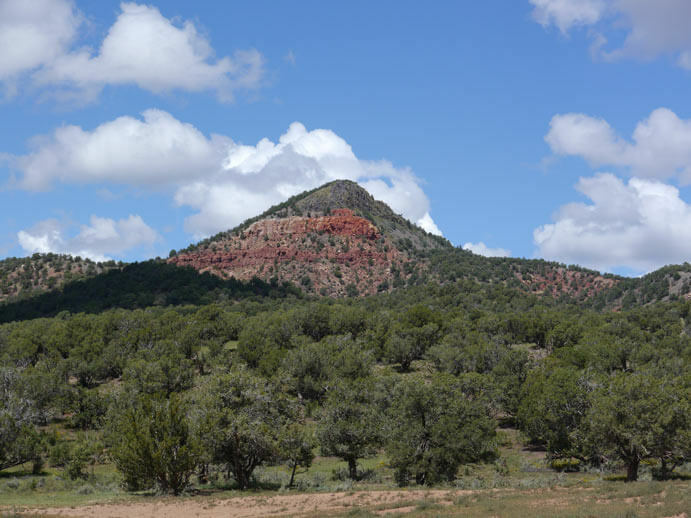 Red Butte is a sacred site and designated as a traditional cultural property, Canyon Mine is located within the sacred site’s established boundaries. The Havasupai Nation & environmental groups have pending lawsuits against the Forest Service and Energy Fuels regarding threats to the sacred site and violations of the NEPA process. A decision is expected any day. If Energy Fuels is permitted to proceed, up to 25 trucks hauling up to 30 tons of highly radioactive ore per day could be barrelling down small roads and highways through Arizona. The ore would travel through towns such as Valle, Williams, and Flagstaff; through Navajo reservation communities including Cameron, Tuba City, and Kayenta; near the Hopi reservation; and finally arrive at Energy Fuel’s White Mesa Mill only three miles from the Ute Mountain Ute tribal community of White Mesa, Utah. On March 25, at the Navajo Nation’s Western Agency Council meeting, Cameron Chapter President Milton Tso successfully sponsored a resolution which requested eighteen Navajo Nation Chapters to ban the proposed transport of uranium ore, contaminated water, and any other material from Canyon Mine. “I am concerned why our elected leaders are not more involved in educating the communities, are they waiting for another disaster before we address this issue? We’re going to do our best to educate and stop the transport of ore and ultimately shut down Canyon Mine! We have faced too much heartbreak from łeetsó (uranium) and we have to leave this monster in the ground!” stated Riggs. This article was originally published at Haul No!